Me and My SoldierMan: Who Wants a Giveaway Prize??? Who Wants a Giveaway Prize??? 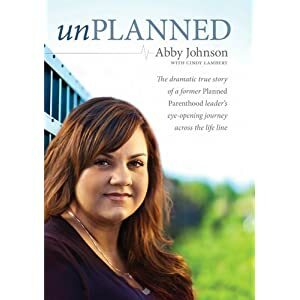 Abby Johnson was an executive at Planned Parenthood. As she puts it, she was a great sales person, who could sell an abortion to anyone. It was easy, she said. A very vulnerable woman comes in to the clinic and it doesn’t take much to convince her that having an abortion is the best solution to her “problem”. After all, she would say, it’s a simple procedure. No big deal. Just a blob of tissue that we can remove and you will be able to get your life back to normal. Maybe the last statement is the biggest lie of all. For sure, it is NOT “just a blob of tissue.” Abby recounts that a visiting physician was going to show them how to use ultra-sound equipment to assist in the abortion procedure. She thought that would be exciting to watch. Abby retells how her eyes were fixed upon the ultra-sound monitor. She had never before seen the reality of what was going on during an abortion. She watched as the baby tried desperately to evade the instrument, succeeding well enough that the physician had to reposition the tube. As Abby put it, it didn’t have a chance. Everyone in the room was its enemy that day. The baby fought a valiant fight. But, Abby watched it eventually being sucked into the tube…dead and discarded. She walked away from the abortion industry, never to return. Abby is not a political activist. She doesn't want to run for office or see anyone elected. She wants to help women and to let the world know what really happens behind closed doors at Planned Parenthood. This book is her personal story and experience. If you want to enter to win it and read it, click here to visit Allison's blog. The thing about abortion is that it's not a one-time event. It's not like getting your tonsils out, though I have heard someone put it that way. There is risk involved. Women can wind up unable to have more children. And regardless of what the talking heads will tell you, women still die from having an abortion every year. But there are more than just lasting physical effects. Some women have lived with the pain and guilt of having had an abortion ever since it became legal, almost 40 years ago. The effects of having an abortion last for years, for both men and women. "Men???" Yes. It's not often talked about, but men are affected by abortion as well, and there are counseling and support groups available. Men who didn't want to be fathers "yet" and coerced their wife or girlfriend to have an abortion. Men who did want to be fathers but weren't given a say in the matter. Men who didn't find out until well after the fact. According to statistics, 47% of women have had at least one abortion in their lifetime. Statistically, that could be every other woman that clicks on this blog. If you are one of those women and you are wanting freedom from the past, there is hope to be found. That's exactly why Jesus came: "If the Son has set you free, you are free indeed!" Here are some good resources to help you start healing. It's never too late. 47%. That number just floors me. I do not wish to judge anyone, because each one of us has our own fights and reasons for living the life we do. However I had no idea the number was so high, it's just heartbreaking, for the baby's sake. Wow. That just breaks my heart... The baby tries desperately to live.. =( So. Sad. As much as I want to read her book, I'm not sure if I could read it without having an emotional breakdown. Oh my goodness that breaks my heart. I want to read it but I don't at the same time...I don't know if I can handle it!! I had no idea the number was so incredibly high. It's so depressing. I read her first chapter last week and nearly broke down. Abortion is one topic that can make me so angry I see red. I don't even like talking about it because I get so angry. I hope I never meet a doctor who has done abortions, and if I ever do, it would be hard to keep my thoughts to myself. *sigh* I'll shut up now. It's just so sad and not fair. There's a lot of psychological issues and pain that go with an abortion that some people don't like to talk about, but they need to be known. My only concern is, the 47% statistic. Does that include spontaneous abortion aka miscarriage? Some statistics include that in "abortion" statistics. That number seems very high, but more realistic when you include miscarriages. I just would hate to know that they are being lumped together because we obviously know miscarriage isn't a choice. Nearly half of pregnancies among American women are unintended, and four in 10 of these are terminated by abortion. Twenty-two percent of all pregnancies (excluding miscarriages) end in abortion. At least half of American women will experience an unintended pregnancy by age 45, and, at current rates, about one-third will have had an abortion. Anyway, even if it's not for me, everyone has a right to make a decision. I think we just need to make people aware how hard it is...it's not a tonsillectomy. Prevention and education is how we decrease those numbers!